2. Dry the mucosa with gauze – don’t let patient close until the impression is made. Otherwise, dry the tissues again. 1. 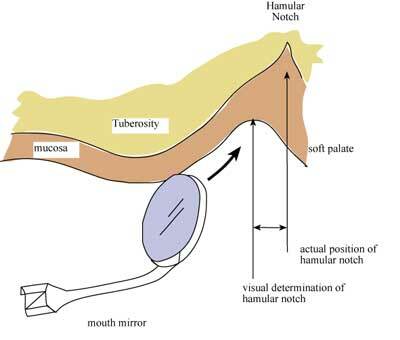 The posterior border of a complete denture and some partial dentures must pass through this notch, between the bony tuberosity and hamulus. Denture border must terminate on “soft displaceable tissue”, to provide comfort and retention. In some patients the notch is posterior to where the depression in the soft tissue appears. 2. Use the head of a mirror, to palpate the notch and mark it with an indelible marker. Ensure the denture terminates posterior to this landmark by palpating the end of the hard palate. The denture should terminate here in the midline at the junction of movable and immovable portions of the soft palate. If the denture terminates posterior to this, movements of the soft palate may cause it to dislodge. If the denture terminates anterior to this, on the hard palate, no seal or a poor seal may be created, and the denture may be unretentive and/or uncomfortable. The marks will transfer to the impressions and the cast when it is poured. The clinician and technician will not have to guess the proper position. Do not allow the patient to get saliva on the indelible mark or it will smear, or not transfer to the alginate impression.